New Luton signing Lloyd Jones admitted the lure of regular football was the main reason behind his switch from Premier League Liverpool to Kenilworth Road. The 22-year-old, who had been at Anfield since 2011, has been on loan to Cheltenham, Accrington and Blackpool during his time with the Reds, plus Swindon Town last season where he made 29 appearances. I’ve come here to play as much as I can and do as well as I can. After playing for the U23s this term, Jones passed his medical with the Hatters this morning and penned a two-and-a-half year contract. 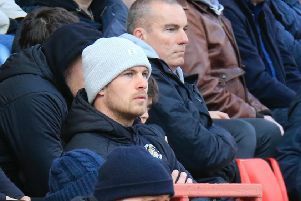 On why he chose Luton, Jones, who watched the 3-2 defeat against Wycombe last night, said: “I found out the move was a possibility about three days ago, it got followed up and here I am today. “I want to play regular first-team football. I’ve been in the U23s at Liverpool for quite a while now and I wanted a new challenge, and I thought Luton was the right club for me. “I spoke to the manager yesterday and he explained how the club wants to move forward and has ambitions, and that was a big factor in me coming here. “Nathan has got a massive passion for winning, and for improving players as well. I’ve come here to play as much as I can and do as well as I can.